IT’S THE STORY that just won’t go away. Irish Water is not just causing a massive headache for the government it’s also causing confusion, stress and worry for householders up and down the country as they grapple with how much water they can use and how much they will have to pay for. 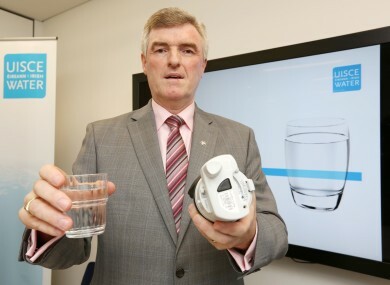 Introducing a new charge was never going to be easy and inevitably hard-pressed taxpayers were going to be resistant but the various scandals, debacles and foul-ups that have engulfed Irish Water since the beginning of 2014 certainly haven’t helped. During the course of a typically robust interview with Seán O’Rourke on RTÉ Radio last January Irish Water chief John Tierney was pressed on how much of the €100 million spent on setting up the new semi-state went on consultants. The answer was €50 million and sure enough there was outrage. It later emerged that €86 million in total would be spent on consultants, contractors and legal advice. Tierney’s revelation about consultants spend inevitably led to him being hauled before the Public Accounts Committee where it was revealed that staff could receive bonuses of up to 10 per cent of their salary. There has been a drip drip (pardon the pun) of bonus information over recent months. Last weekend it was revealed that some staff would qualify for bonuses of up to 19 per cent. 3. How much did Hogan know? The leaking of how much consumers would be expected to pay for water – around €250 a year – before it was discussed at Cabinet prompted a row at between Labour and Fine Gael with then Tánaiste Eamon Gilmore not a happy bunny. Amid a push from Labour to make the charging regime fairer for hard-pressed households an annual free allowance of up to 30,000 litres was announced. In addition, a free allowance of up to 38,000 litres per child per year was promised but Irish Water then suggested that further analysis found that only 21,000 of an allowance for each child was needed. Many have become uncomfortable with Irish Water looking for people’s PPS numbers in order, the company says, to match free allowances with individuals. The utility has insisted it will comply with all data protection legislation in handling PPS numbers and will not hold the details for any longer than is needed. But then how confident can consumers be when it was reported last month that Irish Water sent 6,239 letters with incorrect names to customers. The letters had ironically asked customers to confirm their personal details but had gone to the wrong addresses. Irish Water insisted it wasn’t a data breach, but the Data Protection Commissioner wouldn’t confirm if the company was right. TDs have had to resort to Twitter to get in touch with Irish Water with various public representatives expressing exasperation at the lack of a response from the company. Ordinary customers are reporting long delays on telephone inquiry lines and emails that receive no proper response. Irish Water and its contractors have encountered difficulties installing meters in some parts of Dublin where protesters have blocked access. In some cases gardaí have been called to deal with the protesters with footage of scuffles appearing on social media on an almost daily basis and prompting the Tánaiste to comment on the “expensive” phones and cameras being used by the demonstrators. There was some surprise at the level of turnout for a protest against water charges earlier this month with an estimated 50,000 people taking to the streets as part of the Right 2 Water campaign. Fergus O’Dowd was one of the ministers responsible for the establishment of Irish Water but took aim at the utility in a scathing analysis for the Irish Independent earlier this month. The sacked former junior minister said it had been “an unmitigated disaster” and that there had been “major communications failure”. He then went on Morning Ireland and got into a bit of difficulty. Irish Water confirmed at the weekend that it would cost €188 for a call out to fix leaking pipes. But as management consultant Eddie Molloy pointed out this morning, you could get a plumber out to do the same job for nearly €90 less. Nothing encapsulates the communications difficulties at Irish Water more than the confusion last week over whether tenants or landlords are liable for the charges. The company said that tenants would have to pay but in the event of them not registering with Irish Water the landlord would be contacted. We’re expecting more details on how exactly this will work shortly. In addition, letters sent to tenants part of the Rental Accommodation Scheme in Wicklow caused concern that they could be evicted if they don’t pay their charges. Another scandal has emerged today — in fact, in the hours since we initially filed the very article you’re reading right now. Details have emerged of a data protection breach at the company… The Office of the Data Protection Commissioner has confirmed ten cases whereby a customer of the utility had their bank account details sent to their landlord in error. One person affected by the issue told us he spent an hour on the phone waiting to speak to someone about the problem, but eventually had to give up. Email “14 reasons why people don't like and don't trust Irish Water”. Feedback on “14 reasons why people don't like and don't trust Irish Water”.